AKON, Inc. an industry leader in the development of high performance microwave components and integrated assemblies, announces a new line of solid state microwave coaxial switches operating at frequencies up to 45 GHz. 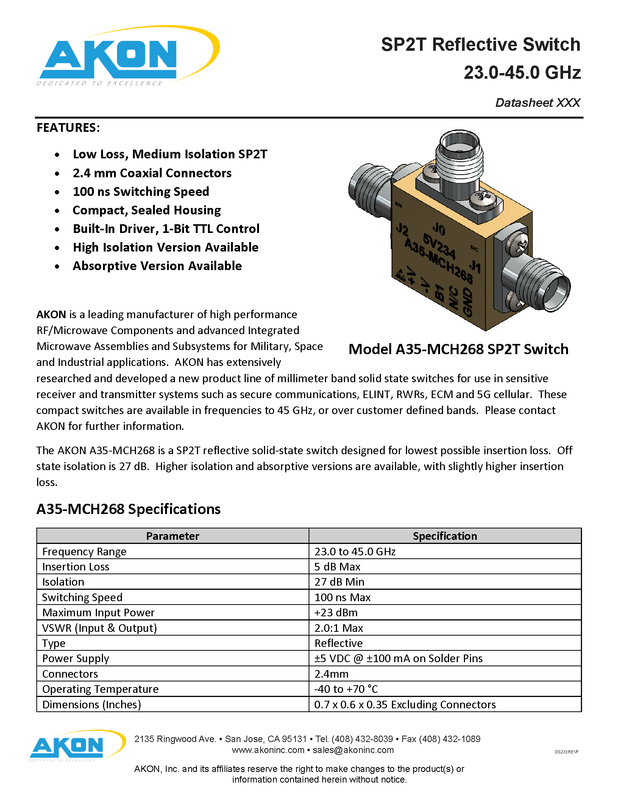 The first product is a SP2T reflective switch operating 23 to 45 GHz, and is designed for lowest possible insertion loss. The insertion loss is 5 dB maximum, while the off state isolation is 27 dB minimum. Switching speed is 100 ns or better. The switches are housed in a very compact sealed enclosure with 2.4mm connectors and solder pins for DC and control. Higher isolation and absorptive versions are available, with some increase in insertion loss. Contact AKON for further information.